Since we’re aiming to provide something useful to you guys every week, we’ve decided to give you another how-to tutorial. This time we’re going to guide you through how to create a hang tag. Because, graphic designers create anything under the sun, why not a T-Shirt brand, right? Since this is just a simple project, we’ll only need two files — the logo of your brand and a hang tag template. Open it on Photoshop and this is what you’ll see. 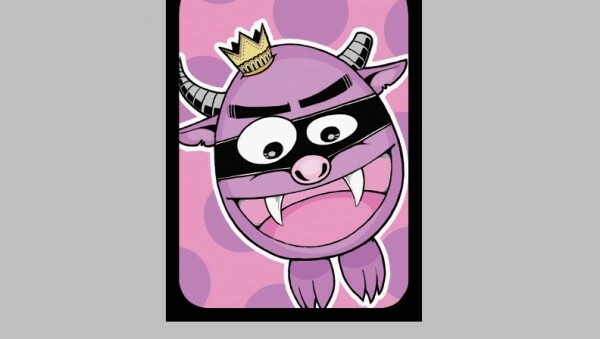 Drag and drop the monster design (or instead of Mr. Monster here, you can use your own logo or design) on the white background. Press CTRL+T and rotate the design slightly counter clockwise until you come up with this. If you’re using your own logo or design, it will depend on how you want it to look like. Double click background layer and choose Color Overlay and color your background #e898c1 and hit ok.
Scatter the circles: hold alt then drag and drop the circle anywhere you want. Just repeat the process until you come up with a polka-dotted design just like this. You can modify the process that we made by adding other design elements. For example, if you want to include text on your hang tag’s design as part of your branding, you can simply insert the process in-between steps. Other modifications you can add to this tutorial is to change the shapes we’ve used, the overall color scheme of the design, and the shape of the hang tag prints. Once you’re done designing and are already planning to have your hang tags printed, we recommend UPrinting’s hang tag printing service. For questions, suggestions and any reactions regarding this tutorial, just leave a comment below! Thanks! If you’ve got any request or a crazy idea you’d want to share with us, just hit us up on Facebook or Twitter. For more tutorials, or design news and inspiration, stay tuned and subscribe to our RSS Feed!